One important question I wasn’t asked on the launch of the Bridgestone Adventure A40 was “Hey, John, can you actually ride off road?” To which my answer would have been a resolute no. It’s not that I can’t ride off road, more that I don’t really get a chance to and as such, tend to look like an ironing board riding a motorbike every time I venture off the hard stuff. 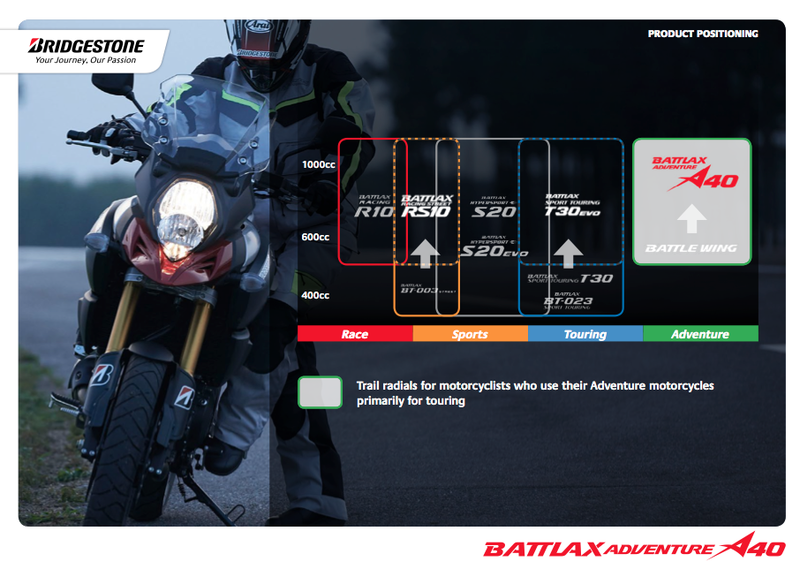 An all weather trail radial tyre, the Battlax Adventure A40 sounds like the kind of tyre that’d be perfect for those that live life on both the road and trail. That may sounds like marketing guff of the highest order, but it’s true. I know because I’m writing this with two fully functioning collarbones, despite having spent a fair chunk of the launch riding on Portugese trails around Lagos on the Southern coast. 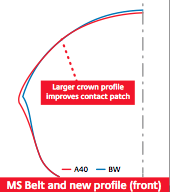 Increased contact patch on the crown. The A40 takes what the Battle Wing previously offered and aims to continue to be able to offer surefooted handling to adventure style bikes, as they increase in power and performance. No easy task when you think about how far this sector has advanced in the last five years. The tread blocks have been extended in the direction of cornering forces in order to increase stiffness and increase stability when cornering. The land sea ratio (land is the rubber, sea is the grooves, the more land you have, the rubber you have in contact with the road surface) has been decreased, meaning bigger grooves to help channel away standing water. Bridgestone has also added some short grooves, allowing the rubber around these grooves to move around a little, increasing stability and feel when cornering. Both front and rear are single compound tyres that use a single steel belt to provide rigidity, though the case construction has been improved over the Battle Wing in order to increase the contact patch and improve grip, this has been achieved by increasing the crown profile (the part of the tyre in between the middle and the edge). New battles old in a spider’s web. New wins! Back to back testing with the Battle Wing during development showed an increased friction co efficient (grip) of four per cent and a faster lap time over a set course on a wet handling track. 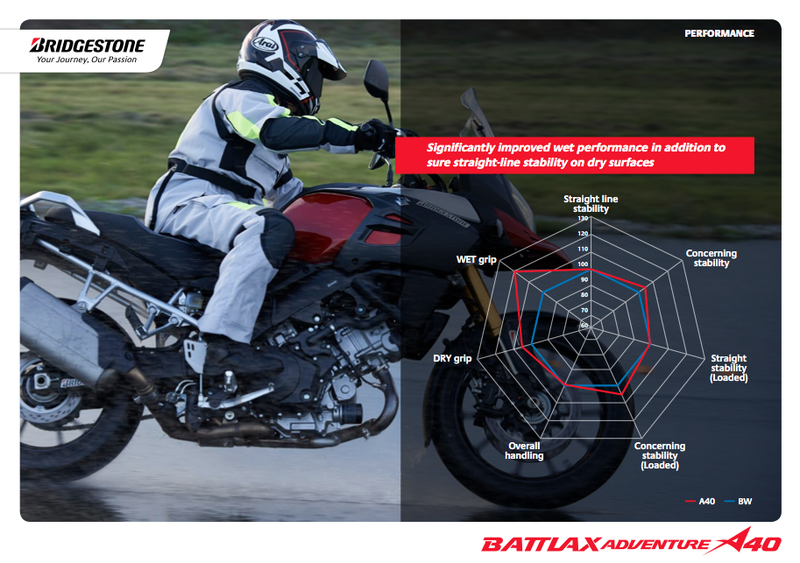 The most notable points in the presentation were the points about the new tyre being more capable of dealing with modern adventure bike performance, as well as having an increased lifecycle. That means more grip on more surfaces, for longer. Or, if you’re a skinflint, it means you’ll get more for your money. Speaking of money, there is no increase in price between this new tyre and the Battle Wing, which is nice. 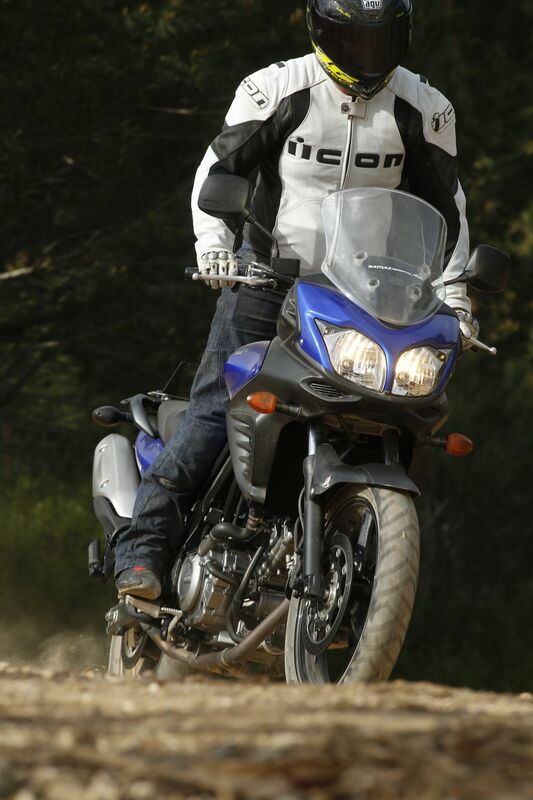 A road and trail tyre in every sense. So, how did they feel? 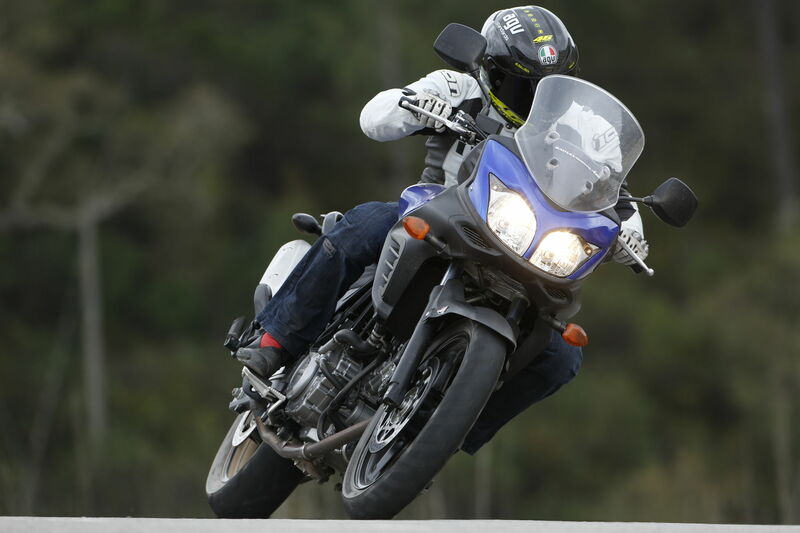 I rode an ABS equipped Suzuki V-Strom 650 on the test route, a very neutral handling bike that I know well. The route was a beauty, just the right amount of broken tarmac and ruts in places, with some fast sweeper and blind hairpins as well. There was never going to be enough poke in the 650 to punish the A40, but there was no hanging around once we got settled into the route. The nice man from Bridgestone was keen to point out the neutral feeling that the tyre has should you feel the need to chop the throttle mid corner. We all know it’s not advisable to do so, but I did anyway, on more than one occasion. Blind hairpins have a habit of nipping up on you like that. The man’s words rung true and the A40 did indeed carve a constant line when the gas was closed. All the way up to second gear peg scraping levels of lean, the A40 was completely dependable. Carrying brake and lean didn’t seem to bother the tyre, in fact I struggled to do anything other than just enjoy the ride, sometimes this is the best feedback you want to hear about a tyre. No skill was deployed during the riding for this picture. When the time came to venture off road, I followed the snaking line of bikes, standing on the pegs seemed to be what everyone else was doing, so I did the same. After a few kms, I began to enjoy myself. The grooves that have increased in size in the tyre have been designed to channel dirt and dust as well as water and I felt happy that they were doing as they were designed to. I often gauge a trail ride by wondering if I could ride a sports bike along the same route. Quite often you see people wearing off road clobber, on bikes that are designed to be ridden on the moon, down trails that are little more than smooth woodland paths. Our route got steadily rockier and more rutted until I passed the point that I thought I’d be able to manage on a road bike. Not only that, but I also found that we were riding along at a reasonable pace, the top of second or a lazy third gear being used mostly. I did cheat on some of the hairpins and sit down, only because I wanted to try and spin the rear coming out of the corners like some kind of desert racing supremo. In my head, I nailed it. The route continued to offer a mix of fast and slow road sections, with stretches of dirt to keep us on our toes. The A40 increased my confidence off road and seemed to be more than capable on road. It might sound like I’m simplifying what the tyre is up to, but if you’re in the market for new rubber for your adventure bike, buy these safe in the knowledge that you could ride year round on pretty much any surface you’d be happy to take a road legal bike on. Click here to find your nearest Bridgestone dealer.